Minutes to Disney! 4 Bed, 2 Bath, large yard, South & West Facing Pool, WIFI! Game Room, (2) 55' TV's, more - read on! Find Your Own Hidden Paradise in this tropical getaway, so peaceful and private, but only minutes to World Drive and All Walt Disney World Parks! •	A large screened patio encloses the pool* and tropical landscaping. •	Private, quiet setting with no rear neighbors. •	The pool is surrounded by a large patio with several lounge chairs for relaxing in the sun, and a patio table with seating in the shade. •	A variety of lighting choices, from subtle to bright, enhance any mood or occasion after a beautiful Florida sunset. •	There is a large private backyard behind the pool/patio area. •	Just outside the screened patio is a barbecue grill and patio. •	Futon and additional seating. •	Large 55” flat screen TV. •	Blu- Ray / DVD / CD Player. •	Large selection of DVDs. •	Wii Game System with selection of games. •	Master suite with King size Memory Foam mattress for a restful nights sleep. Large 32” flat screen TV with Blu-Ray / DVD / CD Player. En-suite bathroom with dual sinks, shower and closet. Private entrance to the pool area. •	Second bedroom features a Queen size bed, 32” flat screen TV with Blu-Ray / DVD / CD Player. •	Third bedroom features two twin beds, 22” flat screen TV with Blu-Ray / DVD / CD Player. •	Fourth bedroom features two twin beds, 22” flat screen TV with Blu-Ray / DVD / CD Player. •	En-suite bathroom with dual sinks, shower and closet. Private entrance to the pool area. •	Second guest bath with shower. •	Open and airy design with a sofa and loveseat. •	Blu-Ray / DVD/ CD Player. •	Computer with high speed internet. •	Another set of sliding glass doors overlooks the pool. •	Table and chairs for a meal or family gathering. •	Large sliding glass doors afford a view of the pool. •	Completely equipped – including appliances, pots, pans, dishes – everything you need. •	Great way to save time and money by having breakfast at home before going to the parks! •	Stay in and spend time together for dinner while preparing a meal at home. •	Open to the Family room. •	Plenty of comfortable seating with a sofa, loveseat, and arm chair. •	Peaceful, quiet atmosphere, great to relax and read a book. There is a selection of books by popular authors to choose from located in the Game Room. •	Comfortable seating for six. •	Large window overlooking the pool. •	Complete with washer, dryer, iron and ironing board. 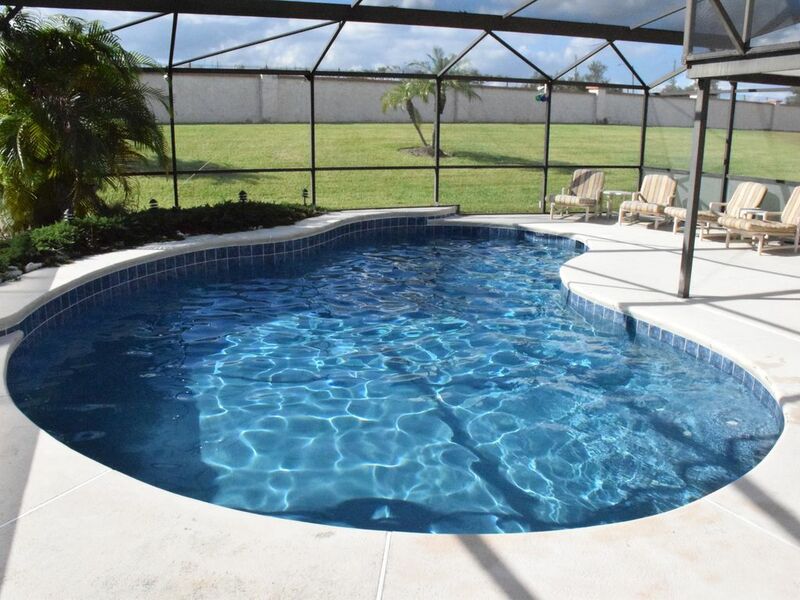 *Pool heat is optional, please inquire while booking your dream vacation. Keywords: Private Villa, House Near Disney World, Villa Near Disney World, Near Disney World, Walt Disney World, WDW, Disney, House Near WDW, Villa Near WDW, Near WDW, Close to Disney, Close to Disney World, House For Rent Near Disney, Villa For Rent Near Disney, House For Rent, Villa For Rent, House For Rent Near Walt Disney World, Rent a House Near Disney World, Villa For Rent Near Walt Disney World, Rent a Villa Near Disney World, Home Near Disney World, Home Near WDW, Home For Rent Near Disney, Home For Rent, Home For Rent Near Walt Disney World, Rent a Home Near Disney World, Orlando. We have been avid Disney fans our whole lives and wanted a place where we could relax after a day at the parks. After touring many properties, we found this gem. We purchased this home from the original owners, a nice retired couple from Scotland that used it to go on holiday. The home was well cared for with many upgraded features, so it gave a 'home' feel rather than a typical rental. We like peace and quiet and privacy. This home sits on an over-sized lot with no rear neighbors, walking paths, or other public distractions. toilet, shower, Guest bath with shower. (6) 55' LCD TV in Game room 55' LCD TV in Family room 32' Flat screen in master bedroom 32' Flat screen in second bedroom 22' Flat screen in third bedroom 22' Flat screen in fourth bedroom All TV's include DVD and/or Blu-Ray players! Enjoyed the house, game room, and pool. Quiet neighborhood. Only thing that we could of used in the kitchen was Saran Wrap, tin foil, or plastic containers for leftovers. Minor thing. Nice big backyard to play catch with a football or baseball. Terrific stay! Super close to parks! Great stay! Loved the house! Super close to all parks! Would definitely stay here again. All issues that we had (and there were only a couple) roger fixed immediately. Only complaint was the pool toys need some attention but not a big deal. Great pool! Kids loved it!! Loved working with owner Roger! Made our stay sooo easy!!! Hidden Paradise exceeded your expectations. Our flight down was delayed a day do to weather conditions. I contacted the owner to notify of our change of plans. What really impressed me, was he refunded a nights stay. "Great Guy"
Perfect place to stay & enjoy all the area has to offer. Minutes from the parks, restaurants, supermarkets, etc. This house has everything you need & more. We enjoyed the private pool, games room, & all of the other amenities. Being so close to the Disney parks, it makes it easy to take a break from the parks & relax by the pool before returning later! I highly recommend this property & look forward to returning. Only 3 miles to Walt Disney World! Close to shopping, restaurants, and all Disney parks and activities!